For several years Samsung was trying to consolidate its grip on UMTS-terminals market in Europe but in fact attached little importance to this question. Let's remember the first Z-series terminal that was in some kind the best copy of Samsung V200. The model was of interest to usual customers but attracted operators little though the UMTS-market is exclusively operator. A year later a renewal called Z105 appeared and a device with index 107 came after. The main miscalculation by the company in the UMTS-market is its inflexible price policy and concentration mainly on GSM-devices. 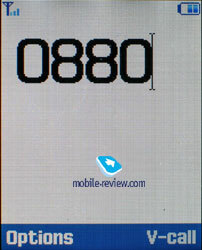 The reason is the company's strategy; Samsung produces devices intended especially for a mass market. For instance, the customers have been complaining of the absence of Bluetooth in Samsung phones and only some people knew that the company developed its own chip even in 2002 and it was certified in 2003. 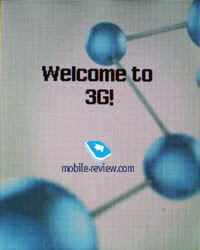 So, by the beginning of 2003 the company had been ready to release its products equipped with this technology. 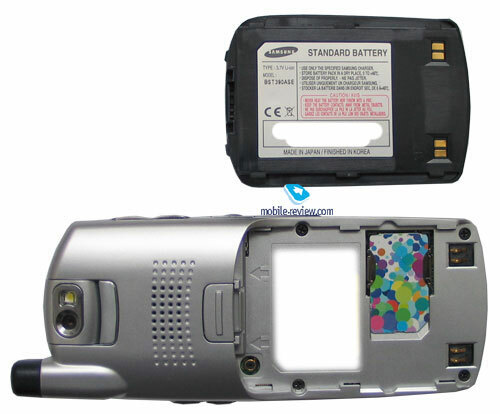 And by the way, the same modules are used in such devices of 2005 like Samsung Z130, D500, E720 and others. The company had considered UMTS-market uninteresting and small for itself till 2005. LG had a controversial opinion and tried to make contracts with operators at any price thus many models are sold at the prime cost in Europe. The company thinks it enters the market and brings up loyal customers with this dumping. This opinion is not right since similar experiments in the GSM-terminals market proved the approach was wrong. In the majority of cases customers choose a device considering several parameters and the brand name is only among them not the only one. Considering similar ideology of Korean manufacturers and higher functionality of Samsung GSM-devices that's not hard to guess what will happen then. A user having a choice between similar products will surely take the most functional and fashionable one. Recently the main question has been when Samsung will find UMTS-market attractive and how much it will interest operators. And if there is no an answer for the second half of the question then the first part seems to be clear. 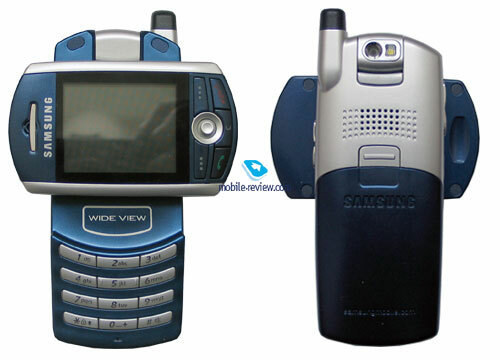 Starting with the second half of 2005 Samsung will have about 5-6 UMTS-devices in the market since the company considers the direction prior. And Z130 will become the first product of this line. At first sight the model is a classic one, just a usual phone. 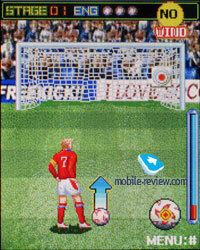 But the screen is rotational and may be turned from left to right. 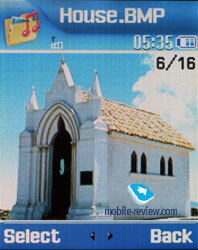 The picture is positioned automatically to correspond with the screen in all the modes. Sometimes that is an advantage. For instance, reading SMS gets more pleasant in a horizontal line since the line grows longer. In general these pleasant things are additional and the main reason of the rotational screen is the only one camera integrated. The main stress of the UMTS devices is a possibility to make video calls and thus the second camera facing you is necessary. And here the camera is rotational and may be turned from or towards you. A flash is also placed in the rotational block. 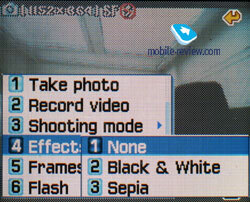 Having turned the block inside in a usual mode you'll protect the camera from dust and that is a slight advantage also. The rotational screen with its unordinary construction is also a fashion element. Ones who wish may never turn the screen since there is no actual need. It may be rotated with one hand but not very easily since the parts slide rather hard. There is no any finishing mechanism in the device. Turning the screen activates the camera by default. 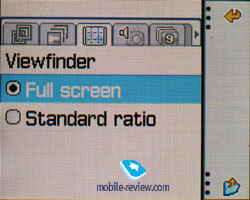 The screen is 262K with the resolution of 176x220 pixels and it is similar to the one in Samsung D500. 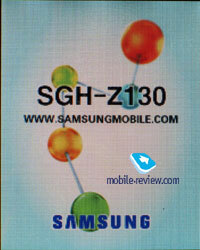 Samsung phones have always distinguished with better screens and this concerns Z130. 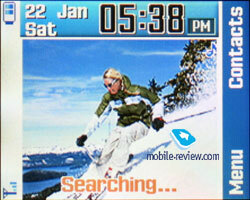 The model shows rather bright and vivid colours having a display much better than of other manufacturers (the only exception is Sharp and Motorola models equipped with similar screens). The quality of the screen has no rivals in its class and even Siemens SL65 differs greatly in the quality of the picture. 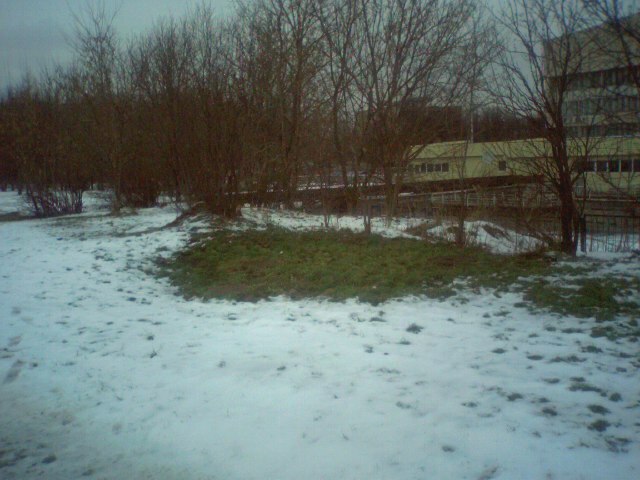 Comparison with Motorola v620 showed no significant difference, so colours and the brightness of the picture are comparable. 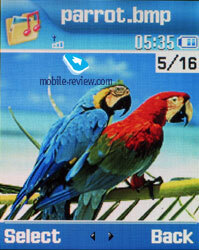 The TFT-screen behaves well in the sun and the picture is seen clearly. 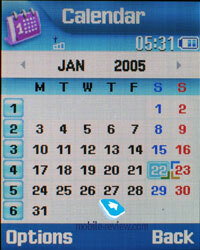 Digital clock serve as a screensaver in the standby mode. 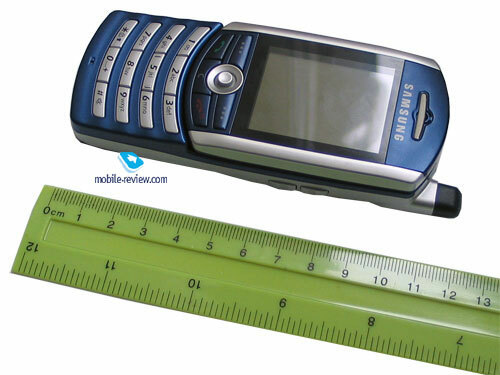 The dimensions of the phone are a not only more than of GSM-devices but also a bit more than of other UMTS-models that will appear at the same time with Z130 (112x46x20 mm). The device weights about 124 grams. Though the phone is not the biggest one and may be used in various conditions comfortably, carrying it in a pocket of your trousers will rouse no problems. You'll certainly find the design very interesting - blue metallic is combined with silver. Silvery edges and keypad add some airiness and elegance to the device. A service indicator looks very interesting. Blue backlighting of service buttons around the joystick plays its role. Number keys are placed in horizontal blocks and are lighted with bright blue backlighting. Though it's not even and the first row is lighted not as brightly. 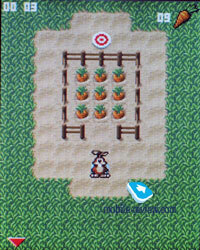 The keypad is comfortable in work as well as the joystick. There is a coupled volume button on the left-side surface and a headset connector closed with a rubber shutter a bit lower. On the right surface you may find two buttons. One of them is responsible for switching between the current tasks (fast line while videocall) and another one serves for turning video off during the call. 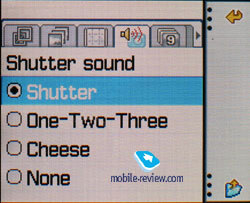 An interface connector placed on the bottom end of the phone is also closed with a shutter. 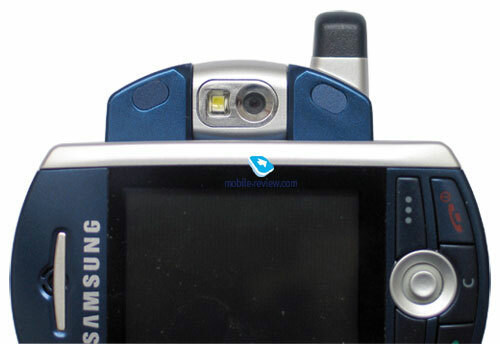 The manufacturers considered a possibility to use a strap for carrying the phone unnecessary. A loudspeaker gap is placed on the back panel. At the same time the back panel is a battery having no backlash. This battery is capacious of 900 mAh and according to the manufacturer it works for 180 hours in the standby mode and up to 3 hours in the talk mode. We tested the device in Moscow and it lasted for 3 days in case of 1 hour and 20 minutes of talks and up to 20 minutes of using other functions. And finally, full recharging takes about 2 hours. 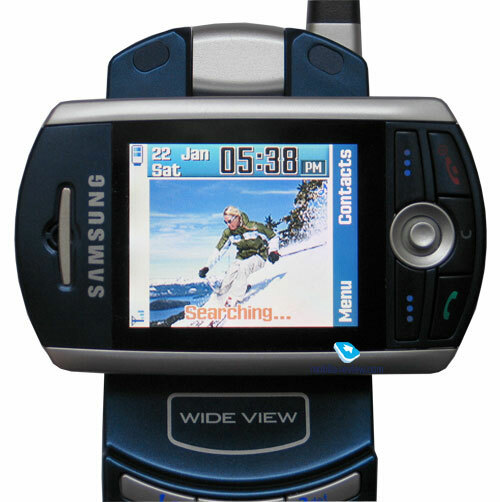 The ideology of the phone really resembles the one of Samsung D500 with a bit different main menu. 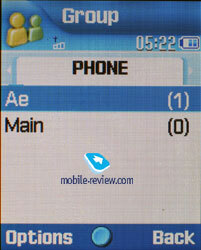 The main menu is represented only in one way that is with a one line of icons. 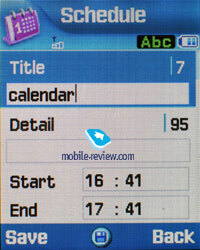 Number navigation using number series is also supported. 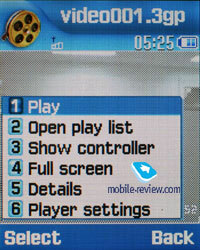 All the submenus are lists and switching between the submenus of the second level is possible by moving the joystick horizontally. 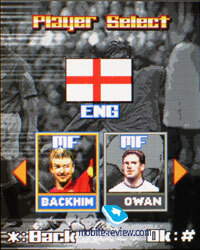 Also you may choose functions from the list to assign to the joystick movements. In general the menu looks logical and navigation makes no problems. Phone book. Pressing the right soft key calls contacts and thus you see a total list representing entries from the internal memory and SIM-card one. 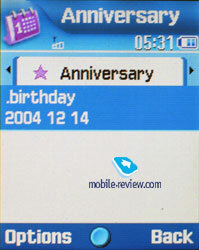 The first name of the list is lighted by default and a default number is shown in a status bar (and a corresponding sign indicates numbers from a SIM-card). There is a search by the first letters and it may be up to 20 of them with the language vary. Having pressed OK you get into viewing a single name mode. 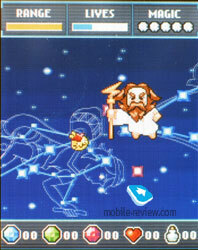 A small icon is shown here if a picture is assigned to a name. Any graphical file may serve as a picture for a name including your photos. Up to 5 numbers of various types may be saved for a name (mobile, work, home, fax, other) and only one of them will be the main (the first by default). In difference to D500 here you can enter various numbers and you aren't limited with the fields, you just add them from the menu. There are two fields for a name and a surname (search is possible only by the first field), when displaying the fields are summarized and the Name comes first. For instance, Eldar Murtazin is shown straight in this order. The length of each field is 20 characters and that doesn't depend on an input language. You may also combine various input languages while entering data. Sort by Name or Surname may be selected in settings. All the entries are sorted in order. 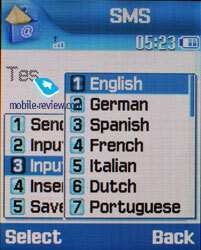 First these are contacts saved in a local language and then all the names in English. That is rather comfortable and customary for computer users. Considering fast switching of a language while search you soon understand that entries in different languages make no problems. So, let's come back to filling the fields in. 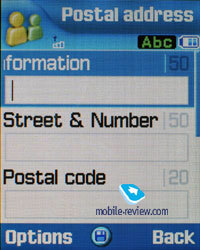 E-mail box, a small text note (up to 100 characters) may be kept besides numbers for a name. Any musical file (even an mp3 melody) may be chosen as a signal for a name. There are three preset groups in the device and one Other. 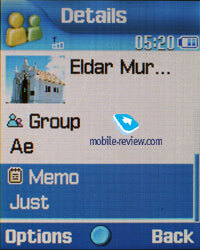 But you can easily create necessary number of groups, select a melody or a picture for it. Up to 1000 names with all the numbers and data entered may be kept in the internal memory. If filling not all the fields the possible number of names will remain the same. You can set the place to save all the new numbers. 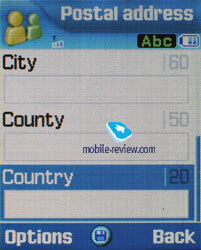 There are also settings for transfer entries from a SIM-card to the phone but not back. 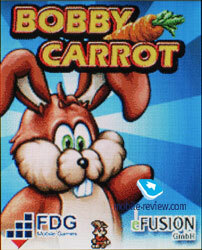 The manufacturers considered a PC the best way of synchronization and in particular MS Outlook. 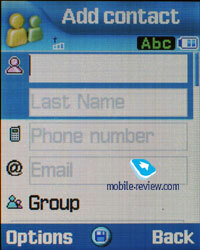 Any entry may be sent to another device via SMS/MMS, e-mail. No problems appear and the phone book entry goes to another device and there may be made out easily. Entering new names is possible only via the main menu and right soft key only calls a list of names. 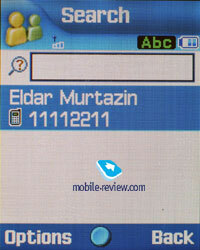 Personal vCard may be kept in the phone and its format is completely the same as of a usual phone book entry. Up to 8 numbers may be used for fast dialing and even several numbers of the same name may be included into the list. The buttons are assigned a number but not its type. That is interesting to compare possibilities of the phone book with other phones. The number of fields is less than in MS Outlook and that's why there is no a full compatibility with this program. That means the device loses to all the smartphones (they have maximum possibilities of a phone book). So, the phone book is worse realized than in Siemens or Alcatel. At the same time the model may surely compete with all the other rivals. And the device is still one of the best and most comfortable in work with the phone book. 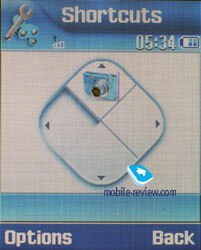 At the incoming call the picture is shown not for the whole screen but takes a part of it (120x140 pixels). That is in some kind a minus of the device and we'll hope the manufacturer will improve this omission in future. Another disadvantage and a noticeable one is the absence of voice dialing. This function is interesting when using a Bluetooth headset or a speakerphone kit in a car. Call lists. Up to 20 numbers are shown in each list. 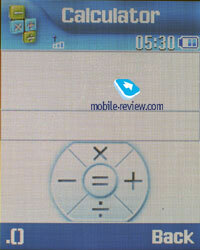 A general list unites all the numbers with a special icon indicating the type of the call. Switching the navi button horizontally allows fast shifting between the lists. When viewing in details date and time of a call are shown for a separate entry but the duration is not indicated. 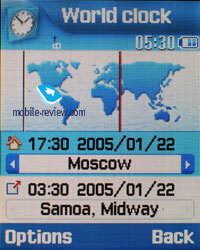 A total call time and cost (if the service is set up) are viewed from this menu also. Messages. 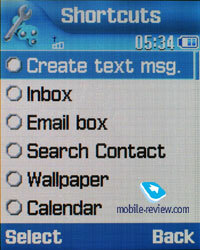 Working with various types of messages is possible from separate submenus. So, let's traditionally start with short messages. 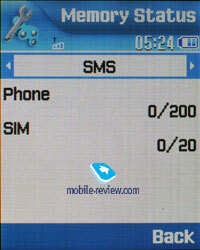 Up to 200 messages may be stored in the internal memory. 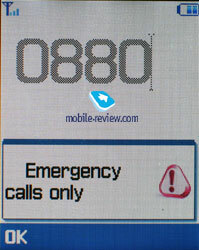 The device supports EMS standard and is compatible with Nokia Smart Messaging. 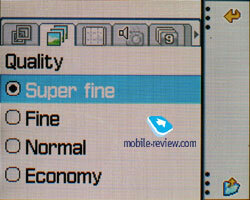 A pleasant peculiarity of the phone is a possibility to support various codings selected by a user (GSM or Unicode). 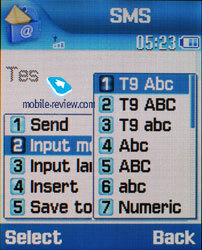 T9 is well-realized and thus working with messages gets easy and pleasant. MMS. 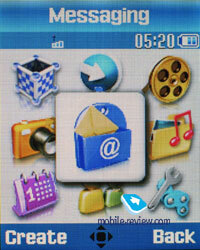 We liked the interface for working with multimedia messages and the messages may be saved to various folders. 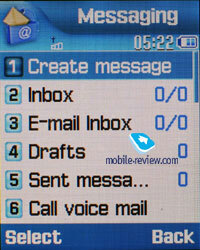 An outgoing message is limited in size and can't exceed 295 KB though an incoming not at all. I also would like to stress such possibilities as rejecting ad messages and selecting a message type that is in roaming or in home network. 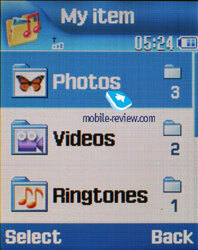 The messages are saved in the total memory and there is no memory separated for MMS specially. Mail client. 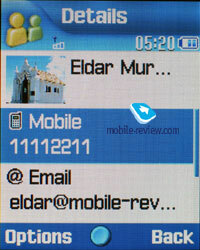 POP3/SMTP are supported and a user may create several accounts. 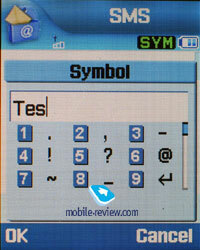 So, the device allows either loading headings of the letters or their bodies fully. Only graphical attachments are possible (GIF, JPEG). 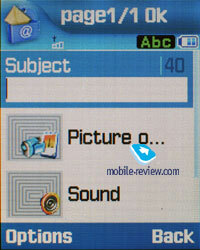 When sending a letter you may attach photos taken with the integrated camera. 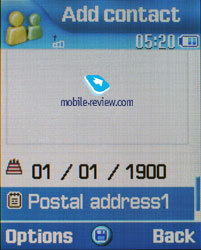 Thus the mail client is not very ascetic generally but doesn't show off with great number of functions. There is a possibility to create templates. Entertainment. 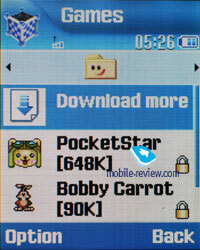 This menu hides three games - PocketStar, Bobby Carrot, Free Kick. 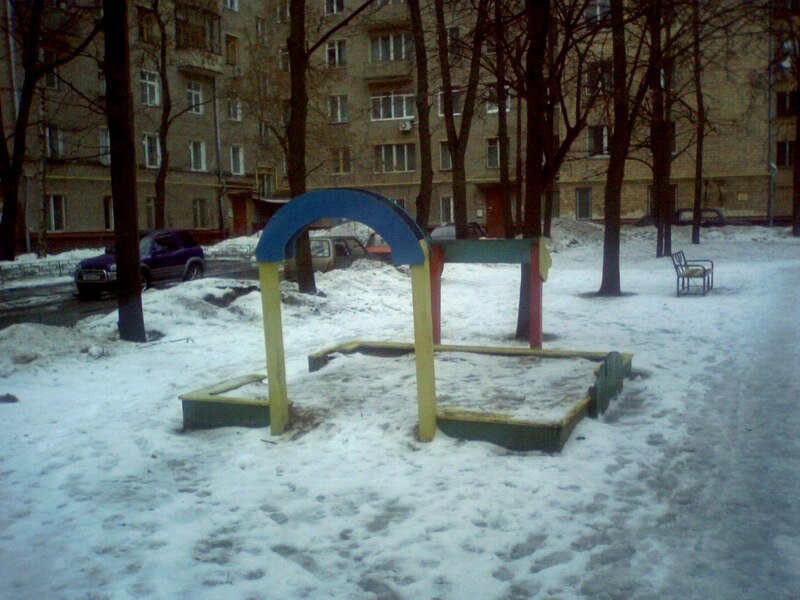 We liked the games and consider them colourful and interesting. 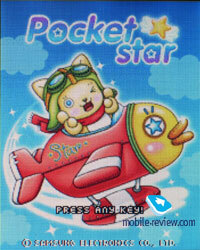 The device also supports Java MIDP 2.0 and 16.5 MB of memory are kept for games. Media player. The device provides an integrated mp3/video player supporting mixed reproduction, according to the list and cyclic. 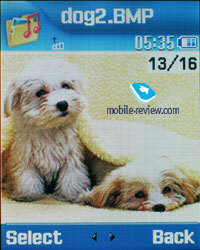 Mp3 files may be uploaded to the phone either straight via sync software. 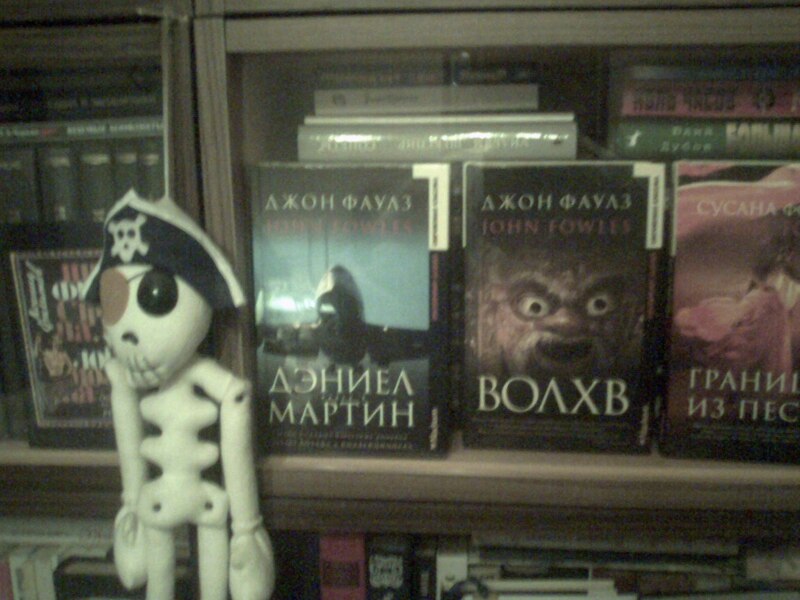 The files may have any tag or name even in Russian since the phone understands them well. Byte rate plays no role since the device reads all the possible formats well. Though we had some problems with VBR files when the device refused loading them and showed a mistake notice. 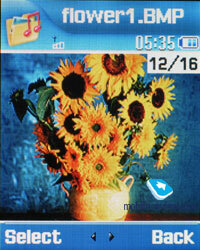 But at the same time some VBR and mp3 files were successfully downloaded into the phone and played well. When reproducing the current track number is indicated as well as the total number of tracks. Three are no special settings for equalizer and it serves rather for fun. Playing is possible both via a stereo headset and a speakerphone. There are 10 volume levels, a possibility to create up to 10 personal playlists. And totally about 50 MB of memory may be used for mp3 files and that is enough for an hour and a half of good qualitative music. The player is realized neither in better way nor worse than others. Everything is rather simple. Video may be played full screen and that's enough to turn it and the picture will be shown full size. That is a great advantage. Organizer&Tools. 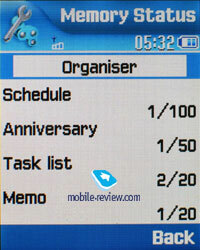 Several interesting functions are gathered in the menu at once, let's consider them. Dictaphone. 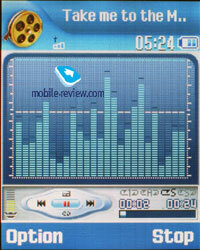 Up to several hours of voice memos may be recorded and the number of the records in not restricted. 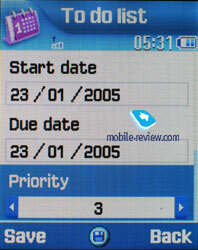 In principle a user may put limits on the duration of the record and it may be from 1 to 5 minutes. All the records are stored in a separate folder. 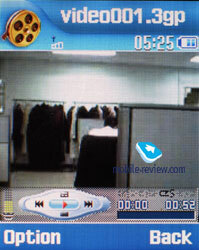 The dictaphone works only in the standby mode and thus can't record a conversation. World time shows time for two selected cities and everything is plain and clear. Alarm clock. There is a once or everyday alarm clock. 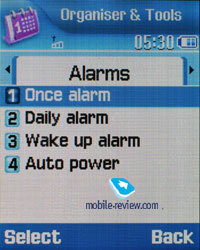 Personal melody including mp3 may be chosen for an alarm. There is automatic On if the device was turned off..
Calculator - everything is plain and clear. 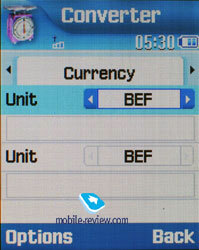 Unit converter allows converting one measure units into others and a currency converter is also here. Organizer. 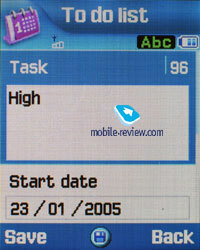 Up to 100 events of the four foreseen types may be stored - meeting, task, anniversary and other. Each entry contains not only the time and date of the event but its duration also. 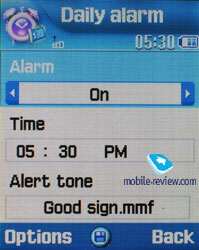 You also may set a signal type and an interval for the alarm, there are recurrent events. 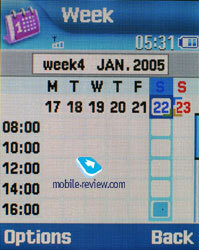 Month and week views of the calendar are rather comfortable, every event is indicated in its colour and everything is visual. Up to 20 text notes with 100 characters in length may be created. 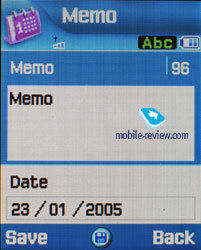 There are no any alarms for these memos. My Item. In general, all the files like music, pictures, video and sounds are gathered here. All the downloaded files come here. A slight disadvantage we noticed is sometimes a file is shown not at once but you need to leave the menu and then enter it again. WAP. 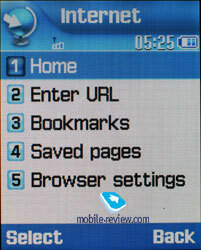 There is a wap-browser version 2.0 and similar to many products by Nokia and Sony Ericsson http protocol is used for accessing the net. That means in some networks operator settings are necessary. 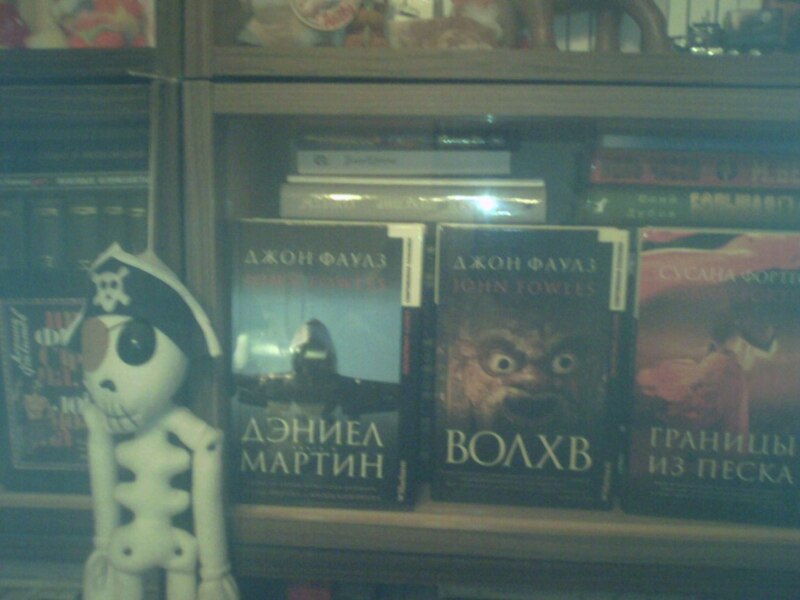 For instance, in Moscow the service didn't work for the moment the review was written and we couldn't use the phone. Settings. The list of settings is rather usual. Here you may see wall-papers, font-type and colour. Adjusting Bluetooth is rather easy and no problems appear (only headset and handsfree profiles are supported, you couldnt connect phone to PC or other devices). Camera. 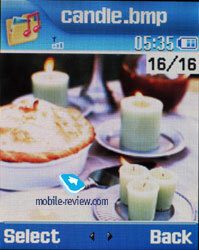 There is a megapixel CMOS camera integrated into the phone. The quality is average and not higher. The photos look not bad on the screen but awfully on a PC. 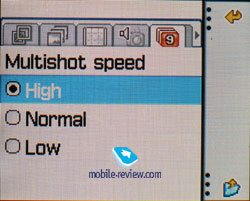 The work of the viewfinder in a standard mode is a disadvantage since you see only a half of the picture through it and when shooting you get a bigger viewing angle. 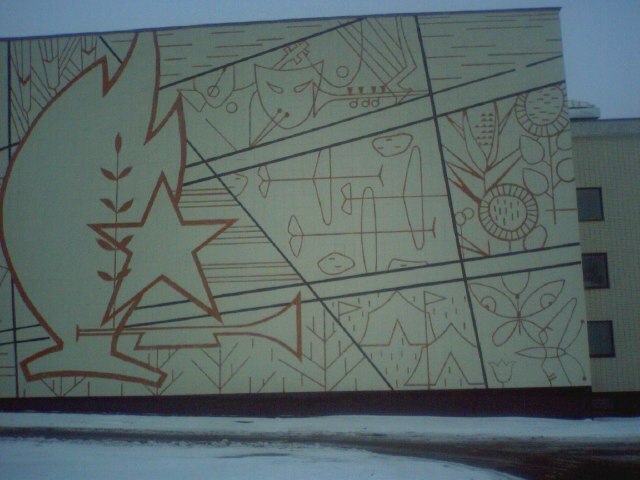 The flash work tells on the photo quality negatively and the picture gets a blue hint. When the flash is off the quality of the photo is higher. 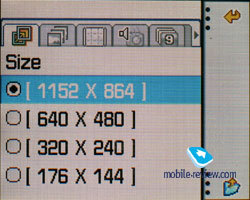 The maximum resolution is 1152x864 pixels. Various frames and effects are worth mentioning. 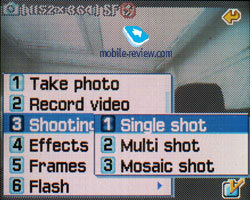 The model also supports recording video with sound and without it. Indoors photo sample with the flash, without it and with a night mode on. Once more in the street and outdoors again. The device rouses no cavils in the quality of connection. 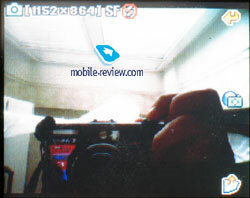 The model is based on Samsung D500 and a plainer megapixel camera should be stressed (sample photos in a separate review), the absence of IrDA, a less memory and less divisions for standard functions. A possibility to assign personal melody for separate events is an advantage. The 64-tones polyphonic call alert is heard well and is rather loud. The power of a vibra is higher than average. 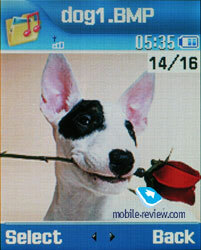 Today there are no similar phones with a rotational screen but its necessity rouses doubts actually. 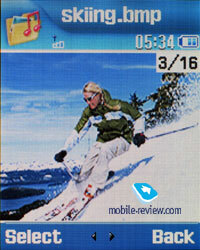 The device can't also be considered the strongest UMTS-model by Samsung since that is a standard offer, a basic model. The company plans to offer more functional models basing on this device in a year. So, Z130 may be considered a low-end UMTS-solution since the company doesn't intend to release plainer models. 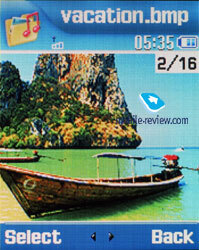 This device won't appear in the Russian market since there is no need in the phone due to the absence of 3G networks. The model is interesting in a qualitative screen and a standard set of functions that will be attractive to the majority of customers. 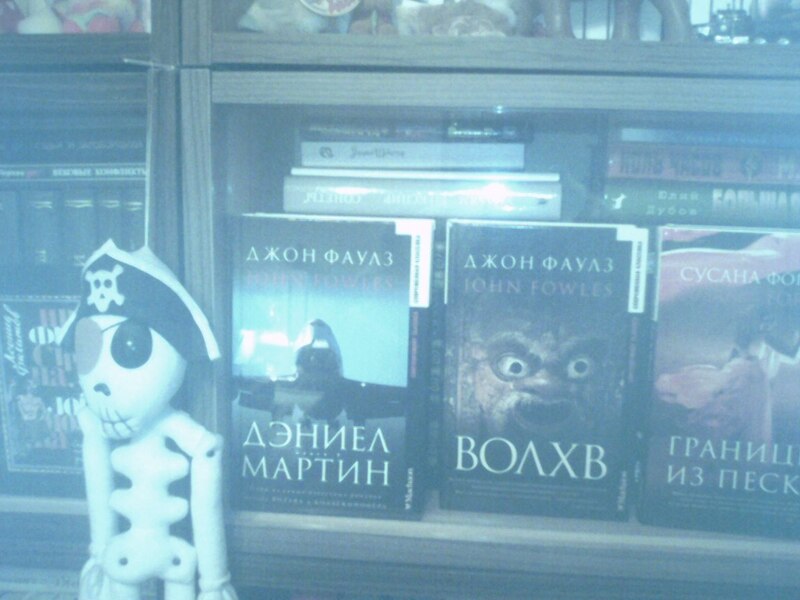 A real disadvantage is a middling camera quality. So, the device may be considered the first attempt of the company to conquer the UMTS-market. Also some light slowness in some menus or when leaving the standby mode (especially in the edges of coverage areas). Bluetooth is realized much worse than in D500 with frequently interrupted connection and impossible file transfer to the device. 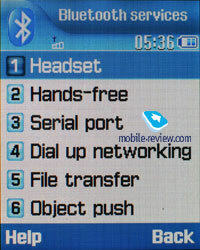 Due to it Samsung is enable only 2 bluetooth profile in commercial samples of this model, you couldnt connect it to PC.